Adding customer payment requests and processing into your current SMS customer conversations and newer channels like WhatsApp, Messenger etc. is now a reality. With over 56% of people preferring to message rather than talk (and that figure is only going to rise), customers are ready to make payments as part of their messaging conversations . So how does this shift to messaging affect collections? Adopting a conversational messaging approach to customer engagement and collections has proved to be very successful in getting customers to respond and start a dialogue. With the conversation now started, how can you make it easier for agents to quickly send customer payment links via SMS messaging, on-line chat or even on a phone call, and capitalise on the opportunity to collect 'that payment' during a live customer conversation when customers are more likely to take action. The good news is that to add messaging payment functionality through your existing Payment Service Provider is easy using WebioPay. Bring instant PCI compliant payment requests and processing into live customer conversations. 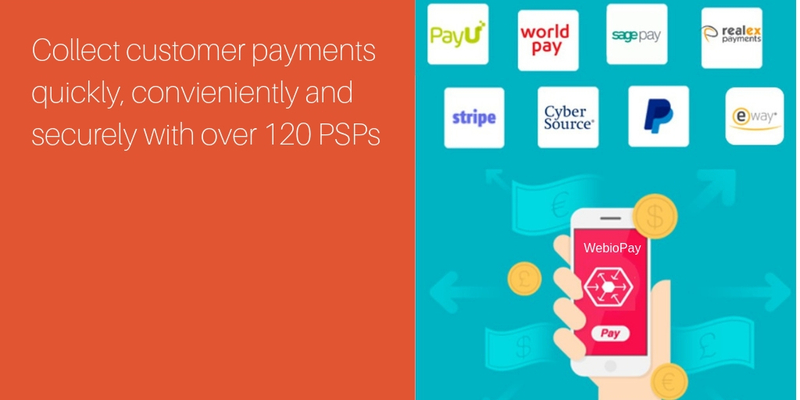 Easily set up payment gateways with over 120 global PSPs. Webio, The Conversational Middleware Company™ brings true AI driven customer conversations to the enterprise. Webio 's channel agnostic conversational interface engagement platform uses the power of AI driven chatbots, machine learning and NLP to introduce a 'blended AI' approach to customer engagement that lets AI agents work alongside human agents to seamlessly engage with customers.